We have in stock super low priced deluxe Acrylic Raffle Drums sized just right for your event! These acrylic raffle drums work great for promotional giveaways! The see through transparent raffle drums are sure to enhance excitement as attendees watch raffle tickets pile up and rotate inside these raffle drums. the drum spins on a stationary stand, allowing easy tossing or co-mingling of your raffle tickets. The body of this raffle drum has a hinged lid with cam key lock and a large 1/2 inch wide slot for inserting raffle tickets which is balanced to always stay on top when the drum is at rest. the craftsmanship of our acrylic raffle drums are superior to that of other standard raffle drums. Use these spinning raffle drums for displays, as collection containers for sweepstakes, ballots and price giveaway promotions. 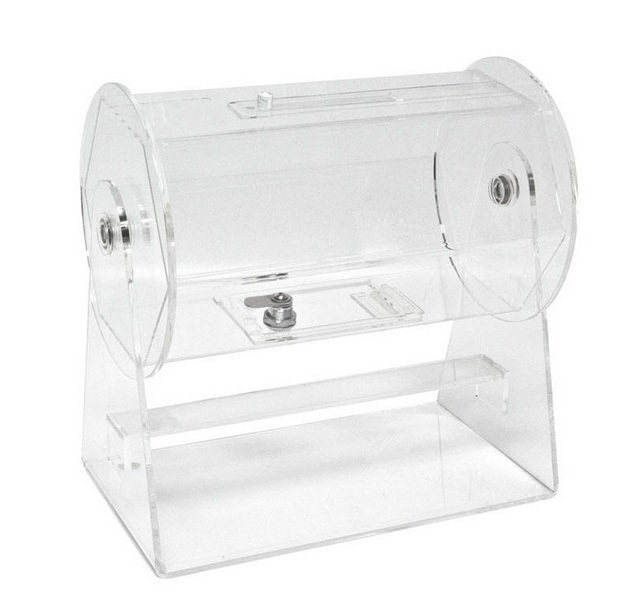 Our standard table top model acrylic raffle drums have been designed to give years of smooth free flowing constant turn operation, while providing a superior mix of tickets. Our units are fabricated from 1/8 inch and 3/16 inch thick acrylic. Holds up to 2000 tickets.